The global phenomenon of the 90s is hitting the Brisbane stage this May. Set during the final years of New York City’s High School for the Performing Arts, “Fame—The Musical”, is the fast-paced, moving and ultimately inspiring story of its last graduating class. Exploring issues such as prejudice, identity, self-worth, peer pressure and perseverance; with a hit contemporary score including its classic title song, ‘’Fame’’, as well as the popular gospel ballads ‘’I Want to Make Magic’’ and ‘’Bring on Tomorrow’’ and now with the candour, humour and insight of director Laura M Meldon, this global phenomenon has been brought to life once more for the MESHpresents 2009 youth production to be performed at the MetroArts Studio on Edward Street. It is from May 21-23, with performances at 11am Thursday-Friday and 7.30pm daily. 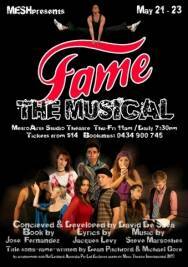 Featuring an outstanding cast of Brisbane performers aged 12-25, with musical direction by Julie Whiting and choreography by Clay English, MESHpresents: “FAME” will be the hit youth production of the year. Tickets $14/child, $16/conc. and $18/adult. Phone MESHpresents on 0434 900 745. Caroline Kovac, Natasha Dua, Grace Pavey, Jossie Mira, Priya Bharat-Khana, Sarah Wilson, Lindsay Edgecombe, Sophia Haworth and Georgia Horsely. Seats are already filling up fast so don’t delay! Profit from this production will be dedicated to furthering youth arts in Brisbane.